“Fulfillment of our constitutional, political, and economic rights are far from achieved and long road of struggle awaits young India,” writes Ashu. It is amazing to discover how reading the same text with different sets of people can provoke new ideas and extract something more out of the text. I recently re-joined the study circle of which I was a part of, around ten months ago, since its inception, when I was on official trip to Delhi. Due to circumstances which arose by joining of new members we had to read the same text we read when study circle was started. The text was Bhagat Singh’s “To the Young Political Worker”. You can read this essay here. To people like us who have interest in political literature, this is the reference point where we start. This is what we almost consider as “The Manifesto for Pro-People Politics”. I wondered what is it about this essay that makes it so special? What message do we derive from this text written 88 years ago, and what it has to do with today’s politics? Why should a youngster today even consider reading it? First of all, let me mention that every reading of political literature and history has to be done in the context with the socio-political reality of the time. Without context, the reading of history is pointless. Similarly, we have to be very careful while reading texts of Bhagat Singh, and have to keep in mind, his political understanding and development within his short political life. So, one might wonder, what kind of change was introduced in the political understanding of Bhagat Singh? It is not very tough to guess, if we observe closely the events surrounding Bhagat Singh. One of the simplest observation would be the introduction of the word “Socialist” in the name of the Hindustan Republican Association (HRA) to make it the Hindustan Socialist Republican Association (HSRA). It was his initiative to have socialist goals on the agenda of his organisation. Therefore, we can easily notice that Bhagat Singh got influenced by “Scientific Socialism” and turned into socialist revolutionary from a romantic nationalist in very short span of time. Bhagat Singh also got influenced by the great people’s revolution of Russia of 1917 and Lenin, the architect of the revolution. So much was the influence of Bolshevik Revolution on HSRA that on the sixth death anniversary of Lenin, they asked the magistrate to send telegram to Third International and shouted slogans like “Long Live Socialist Revolution”, “Long Live Communist International”, “Long Live People” “Lenin’s Name Will Never Die”, and “Down with Imperialism” in the courtroom. The telegram can be read here. At this point, one can’t be sure if Bhagat Singh would’ve joined any of the communist parties in India if he had lived longer, but one can say with certainty that his inclination towards left were pretty much visible at the time. So, now when we know the political development of Bhagat Singh from nationalist to socialist, the next step for us should be the knowledge of context in which this very short essay was written. Bhagat Singh, was already in jail when he wrote this essay on 2nd February, 1931. He was arrested on 8th April 1929, on the charges of bombing Central Legislative Assembly, and since then he was in jail. Here he did most of his readings and wrote frequently about the political conditions of the country. At the time when the essay was written, the Indian National Congress was negotiating with the British government for some sort of a compromise. 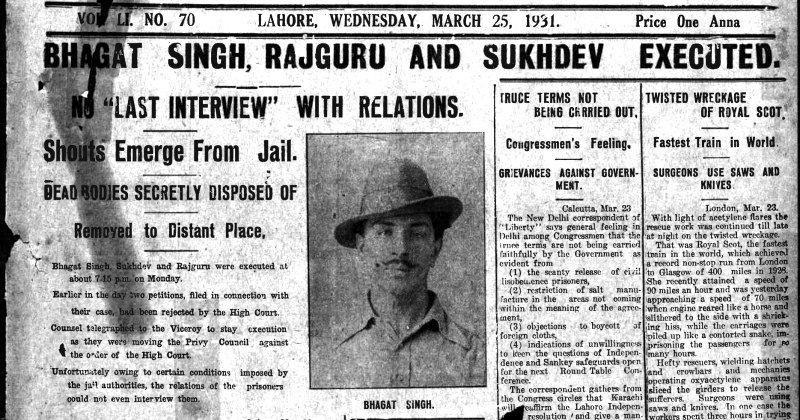 This essay was published in a mutilated form, after deleting all references to Marx, Lenin, Soviet Union and Communist Party, by several magazines and papers, after Bhagat Singh, Sukhdev and Rajguru were executed on March 23, 1931. It was late Comrade Shiv Verma, Bhagat Singh’s comrade-in-arms, who traced out a genuine copy of the document that constitutes Bhagat Singh’s behest to young political workers. A Photostat copy of the full report is preserved in the library of the Martyrs’ Memorial and Freedom Struggle Research Centre at Lucknow. He also suggests to learn the tactics of compromise from the Russian experiment. Bhagat Singh, then mentions that the real revolutionary forces, i.e. peasants and labourers have not been invited to the arena of political struggle. Congress is only representing the interests of shopkeepers and few capitalists i.e. bourgeoisie in class sense. He comments that this is the only reason why political struggle led by Congress is ultimately doomed to end up in some sort of compromise. There will be no significant change in the society if brown rulers like Sir Purshotamdas Thakordas or Sir Tej Bahadur Sapru replace the white rulers Lord Reading and Lord Irwin. The struggle will only be successful if the real revolutionary forces i.e. proletariats will be awaken from slumber. It is also to be kept in mind that, nowhere between these discussions Bhagat Singh rejects immediate reforms, but suggests that these reforms are not the end of the struggle. Larger picture should always be kept in mind. Extent of responsibility transferred to the shoulders of the Indians. From of the Government institutions that are going to be introduced and the extent of the right of participation given to the masses. Future prospects and the safeguards. He also advocates that universal suffrage, should be introduced. Even United Kingdom didn’t allow all its adult citizens to vote at the time. The course of action, i.e., the means and methods. Bhagat Singh borrows the word from Lenin and calls them “Professional Revolutionaries” and mentions that in order to do so, young people have to crush their individuality and personal aspirations in order to achieve the greater goal. In today’s time, when the nexus of casteism, communalism and capitalism are working together to steal public resources and are harming their hard earned rights, Bhagat Singh’s texts leave an everlasting impression on young workers with pro-people inclination. Also, some political parties portrays only nationalist side of Bhagat Singh for their political advantages. But, Bhagat Singh not only rejected all the rhetoric of casteist and communalist politics, he was a vocal opponent of organisation of masses on the basis of caste or religion and their use in the political struggle. He even wrote articles like “Communal Riots and their Cure (Sampradayik dangen aur unka illaj)” and “Why I am an Atheist” to counter communal agenda of cunning politicians. He even sheds his nationalist characteristics in this essay and establish himself as socialist. If we compare the socio-political conditions of today with the times when this essay was written, most of it still makes sense. Although, we have come a long way since Independence, but most of the problems still exist. We are far from achieving the democracy even in a liberal (or, bourgeois) sense, the democracy we celebrate by comparing our country with totalitarian regimes while people here are still struggling for their basic rights. At the same time, almost 40 percent of all wealth generated in the country have been captured by 1 percent of the population, and only 3 percent is left for poorer half of the population to scramble over. Although, architects of our constitution respected the dream of Bhagat Singh and other freedom fighters and declared India as a “Socialist” country, but India is still far from achieving the ideals led out in the constitution. Successive central and state governments have kindled and advanced an economic system in which one single billionaire, Mukesh Ambani, alone owns more wealth than the entire amount spent in the country on public health, sanitation and water supply by the central government and the various state governments put together. Thus we find that the goals of liberal (or, bourgeois) democracy while maintaining capitalist order are incompatible and can only be realised in a socialist society where the goal is the emancipation of all, the greater goal which Bhagat Singh mentions. Today, fulfillment of our constitutional, political, and economic rights are far from achieved and long road of struggle awaits young India. The crux of Bhagat Singh’s texts still stands true, and therefore his message to youth is still relevant. Additionally, the need of the hour is to follow the path charted by Bhagat Singh. Ashu, a resident of Ranchi, is an independent writer. Reblogged this on Recycled Bin.